This article draft reconsiders both Suzuki Seijun’s relationship to the New Left and the applicability of Japanese cinephilic film criticism to questions of history and ideology. It does so by looking at the film Fighting Elegy (Suzuki’s penultimate film for Nikkatsu, made in 1966) through the lens of an article written about the film by the critic Gondō Susumu in 1969. My ambition is that the article will mutually enrich our understanding of both the film and the methodology of the branch of film criticism in which Gondō is working. The paper is available directly below, or at this link. If you have not received the password, or have questions about accessibility, please feel free to contact Helina Mazza-Hilway (mazzah@uchicago.edu) or Susan Su (susansu@uchicago.edu). 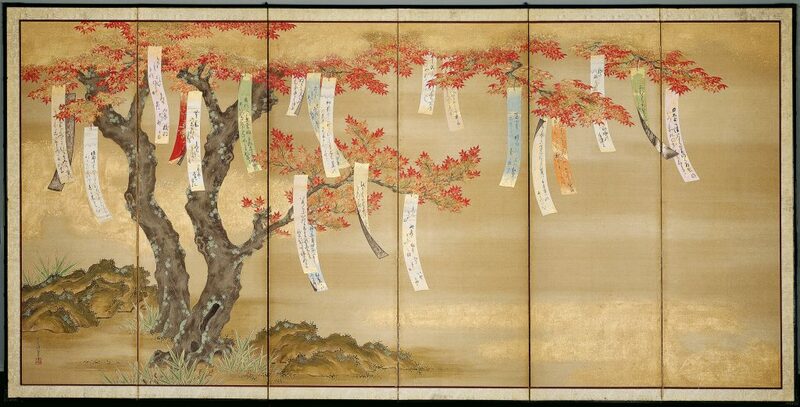 Flowering Cherry and Autumn Maples with Poem Slips. Tosa Mitsuoki (c. 1617-1691) on a six-panel screen; ink, color, gold, and silver on silk.